The building that once stood at the corner of Dwight and Sanford Streets. Photo from Springfield Present and Prospective (1905). As seen in today’s photo, the buildings in the first photo don’t exist anymore, and in fact neither does the street on the right, Sanford Street. The first photo shows two different 17th century houses: the old Nathaniel Ely Tavern in the foreground, built in 1660, and the Margaret Bliss House just beyond it, built around 1695. Obviously both buildings are long gone. 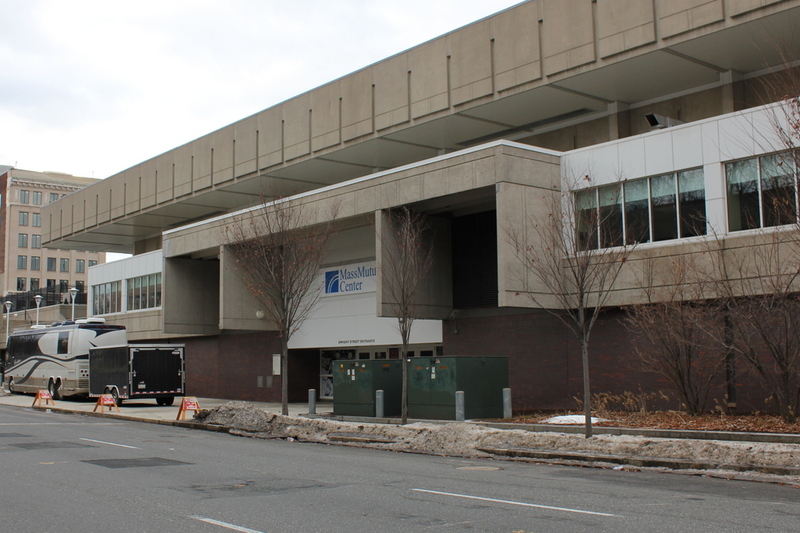 I don’t know when they were demolished, but it is safe to say they were gone before the MassMutual Center was built in the 1970’s. Samuel Hartwell House, Lincoln, Mass. 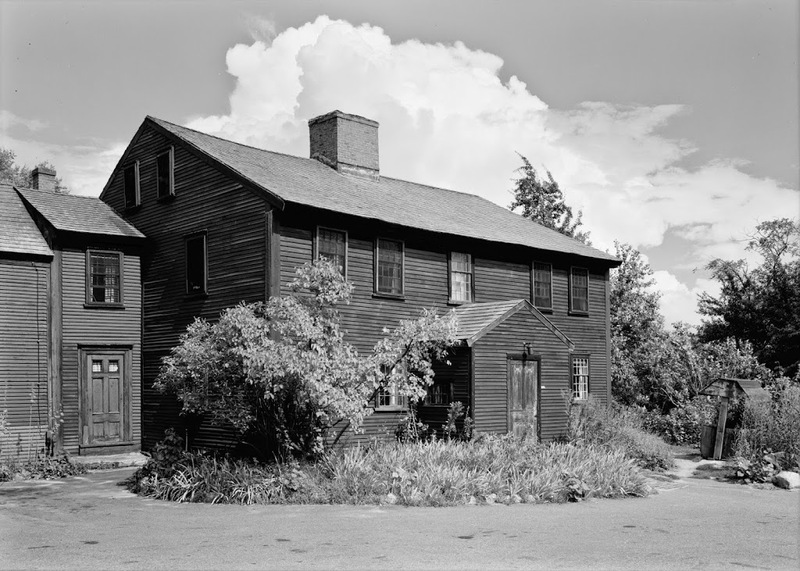 The Samuel Hartwell House, in Lincoln, Mass, in 1961. Image courtesy of the Library of Congress, Historic American Buildings Survey Collection. Located along the Battle Road in the Minuteman National Historical Park, the Samuel Hartwell House was buit in the 1700’s, and was occupied by Samuel Hartwell during the battles of Lexington and Concord, when the British forces marched to and from Concord past the house. The house was used as a restaurant from 1929 until 1968, when it burned. 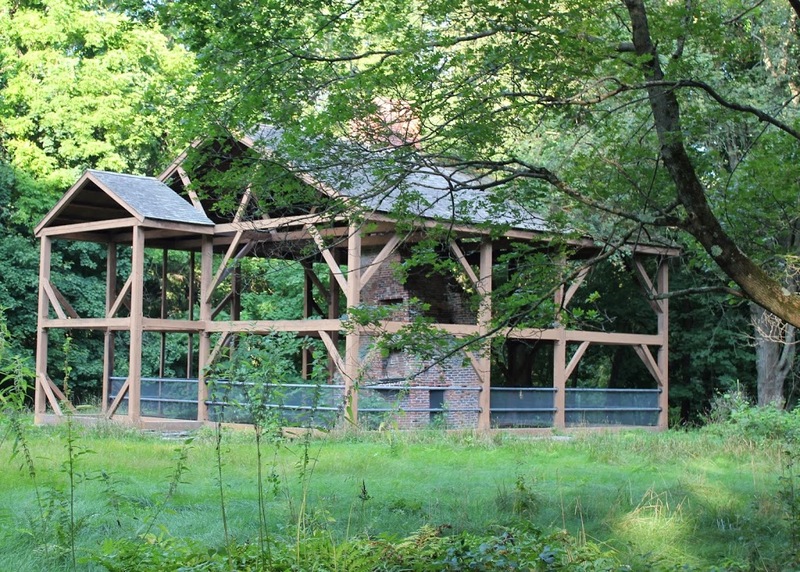 All that remained was the central chimney and the cellarhole; the National Park Service later built the frame and roof in the style of the original building. 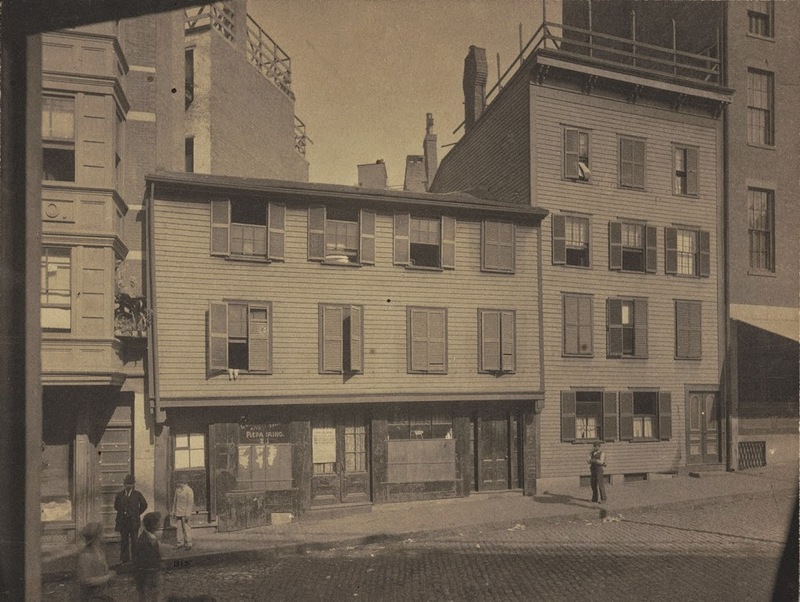 The Old Corner Bookstore in Boston, around 1865. Photo courtesy of Boston Public Library. 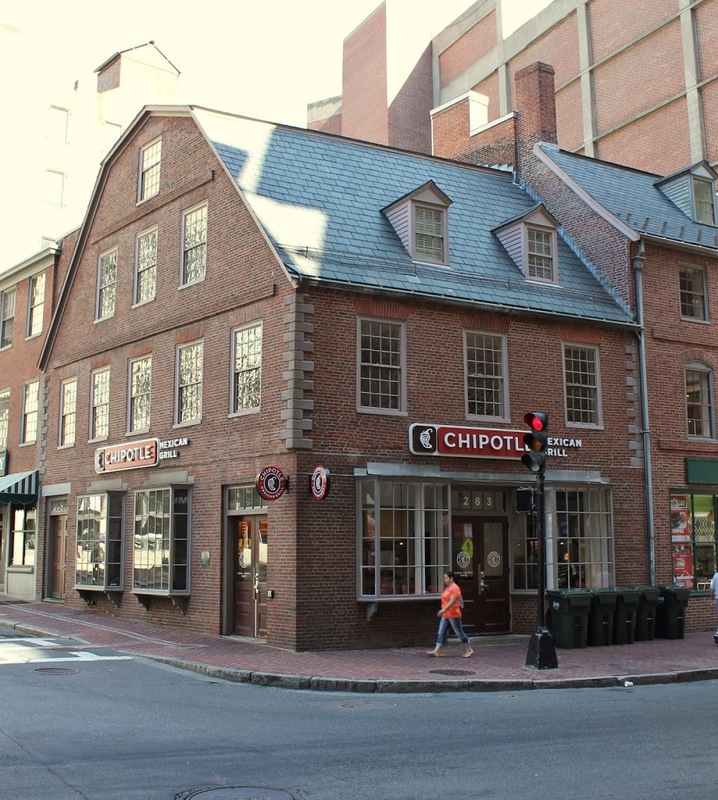 Once a meeting place for authors such as Longfellow, Emerson, Dickens, and Hawthorne, the Old Corner Bookstore is now a place to grab a burrito. 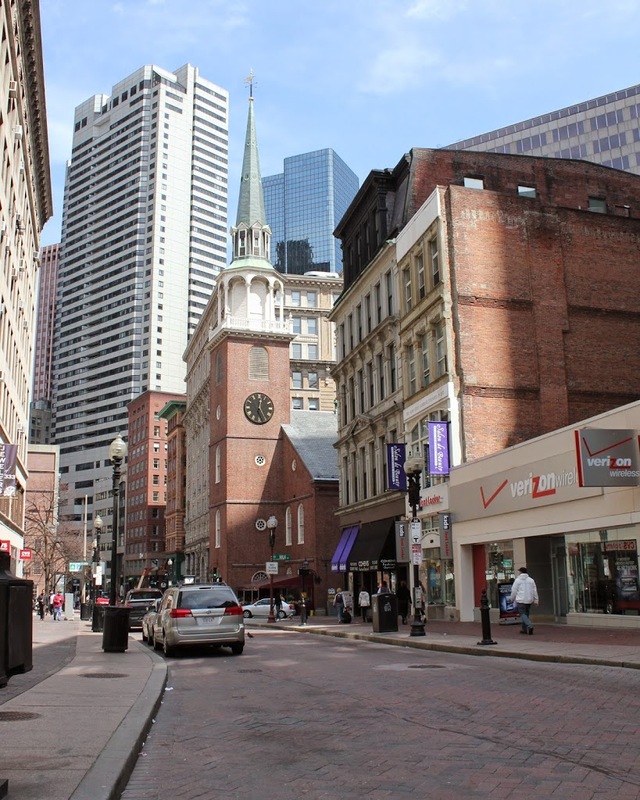 Present use aside, the building has remarkably survived over 300 years in downtown Boston. Built in 1712 as an apothecary shop, it was later used as a bookstore in the 19th century, when the aforementioned authors were known to frequent it. 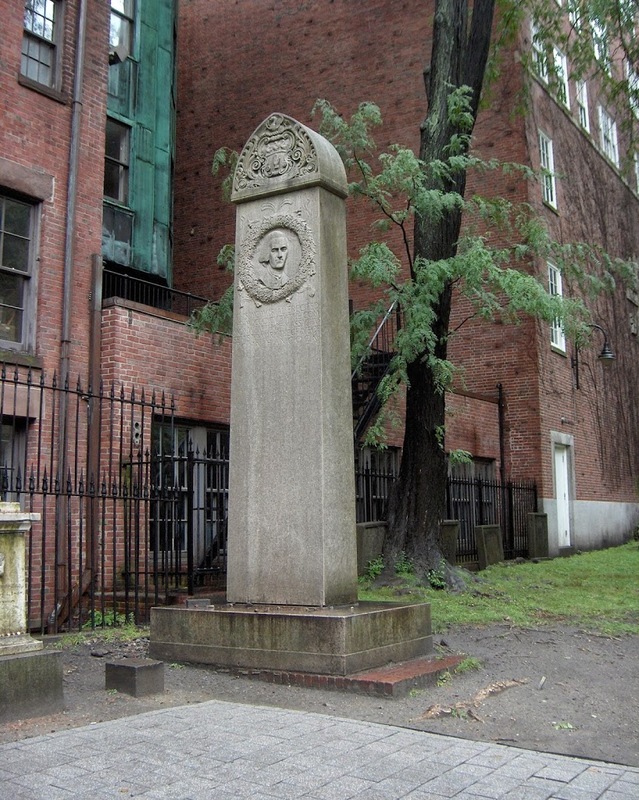 Today, it is a landmark along Boston’s Freedom Trail, and is one of the oldest buildings in Boston. 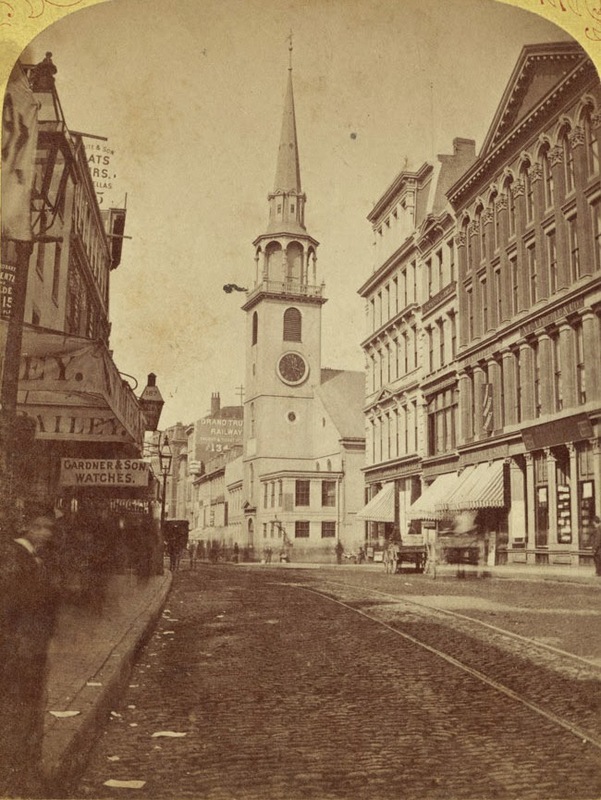 The view looking north on Washington Street toward Old South Meeting House, sometime shortly before the Great Boston Fire of 1872. Photo courtesy of New York Public Library. The same view, in the immediate aftermath of the fire. Photo courtesy of New York Public Library. Around 1875. Photo courtesy of Boston Public Library. Sometime in the late 1940s or early 1950s. Photo courtesy of Boston Public Library. The Great Boston Fire of 1872 was the most disastrous fire in Boston history. It came just a year after the Great Chicago Fire, although Boston’s fire couldn’t hold a candle to Chicago’s (pun intended) when it came to the death toll and property losses. Boston’s fire killed about 30, destroyed 776 buildings, and caused about $73.5 million in damages (about $1.4 billion in 2013 dollars). Chicago, by comparison, killed 200-330, destroyed 17,500 buildings, and caused about $222 million in damage (around $4.2 billion today). 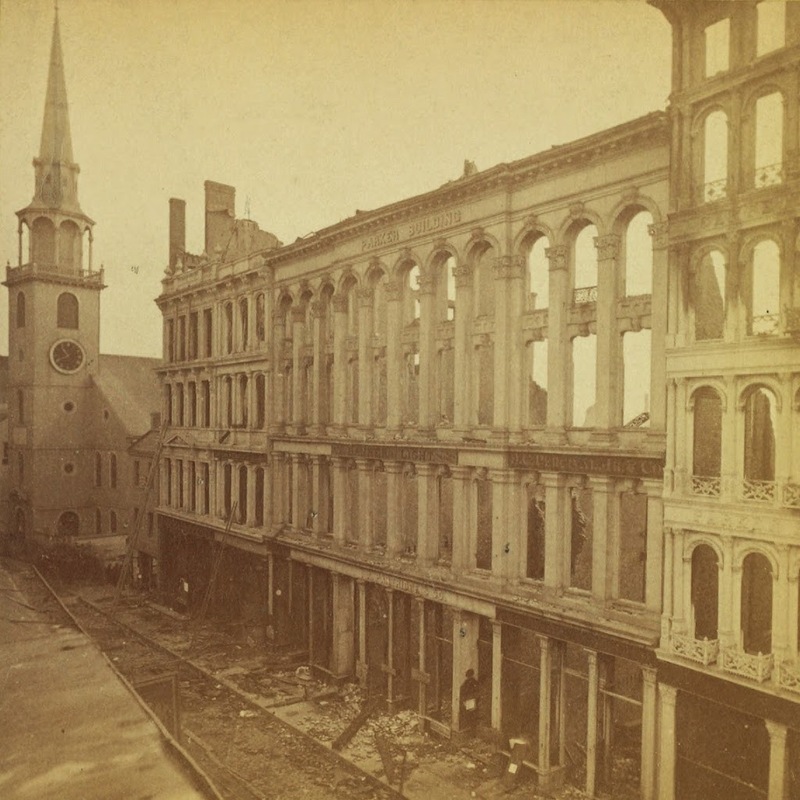 Still, Boston’s fire was extensive in its damage – it destroyed much of downtown Boston, including sections of Washington Street as seen in the first two photos. However, the historic Old South Meeting House, built in 1729, survived thanks to volunteers using wet blankets to fend off the flames. 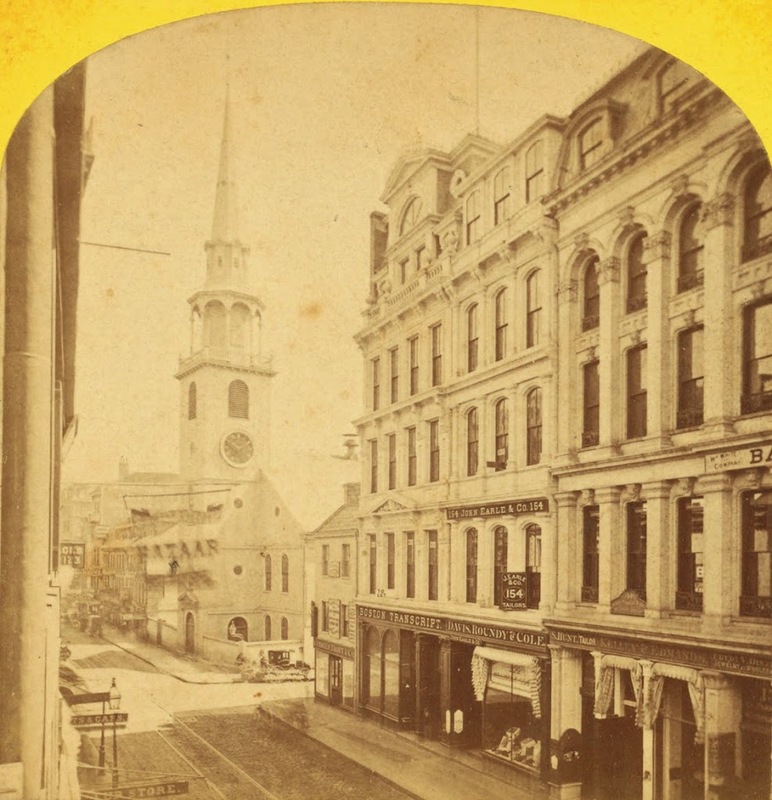 By the time the 1875 photo was taken, Boston was rebuilding, but so was Old South Church. 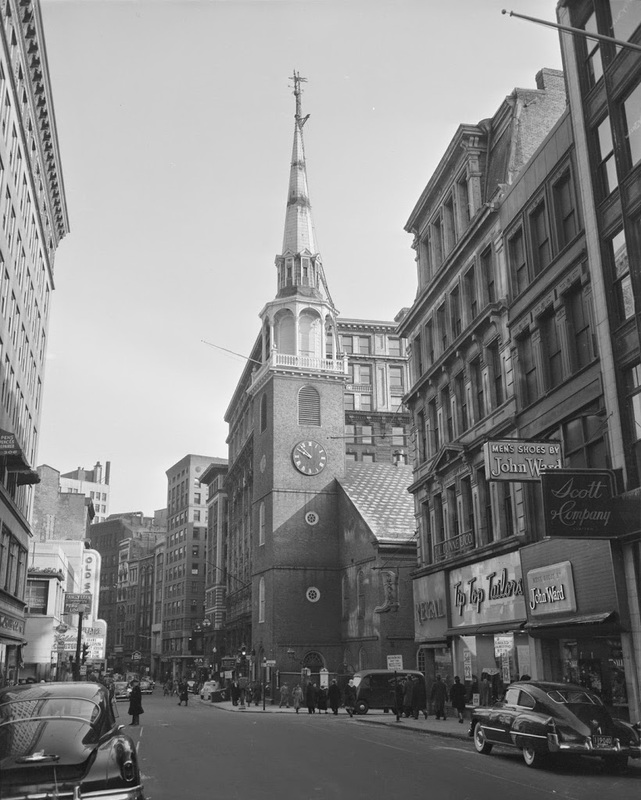 Because the fire destroyed so many homes, people began relocating to the newly filled in Back Bay, and the church followed them, constructing the oxymoronically-named New Old South Church at Copley Square. No longer needed, the historic building was sold and was to be demolished. 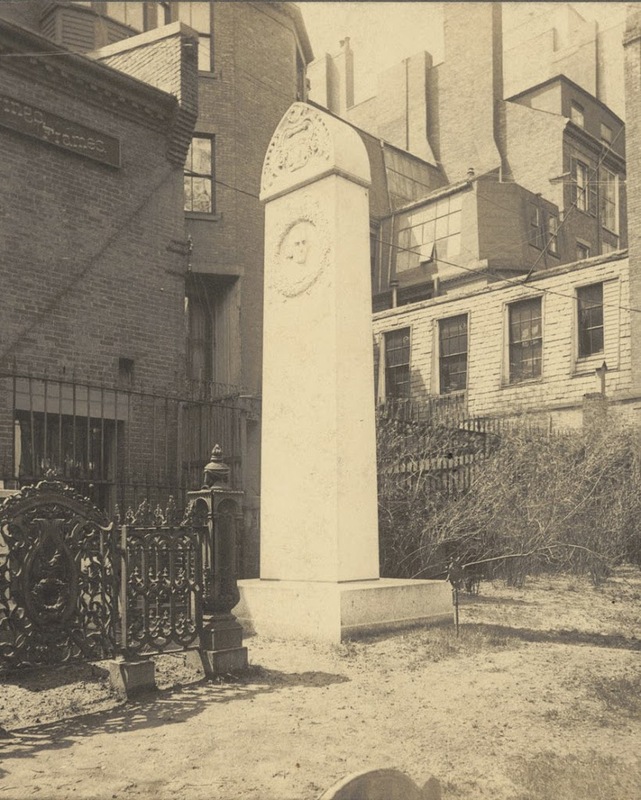 However, given the building’s role in the events leading up the the Revolutionary War, Bostonians rallied to preserve it, making it one of the first such buildings to be preserved for its historical significance. In the last two photos, most of the buildings in the foreground remain the same, although the skyline in the background has changed. The building immediately to the right of the church is actually the same in the last three photos, and it looks similar to the burned-out building that occupied the spot before the fire. I don’t know whether it is the same facade, or if it was just rebuilt with a similar style, but at the very least the existing building dates to the immediate aftermath of the fire. As for the church, today it functions as a museum, although the congregation holds its annual Thanksgiving service at the building. 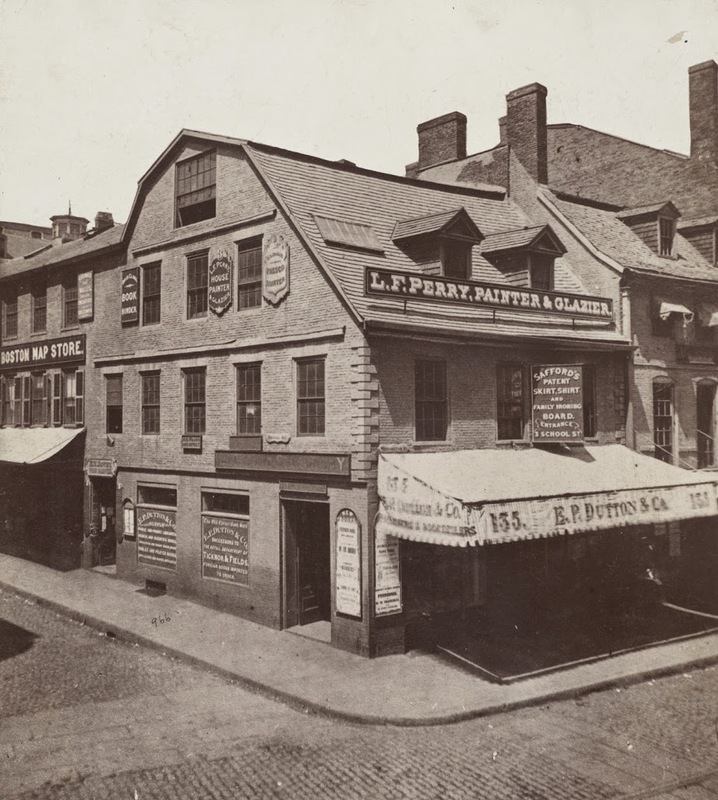 Paul Revere’s House in Boston, around 1898. Image courtesy of Boston Public Library. 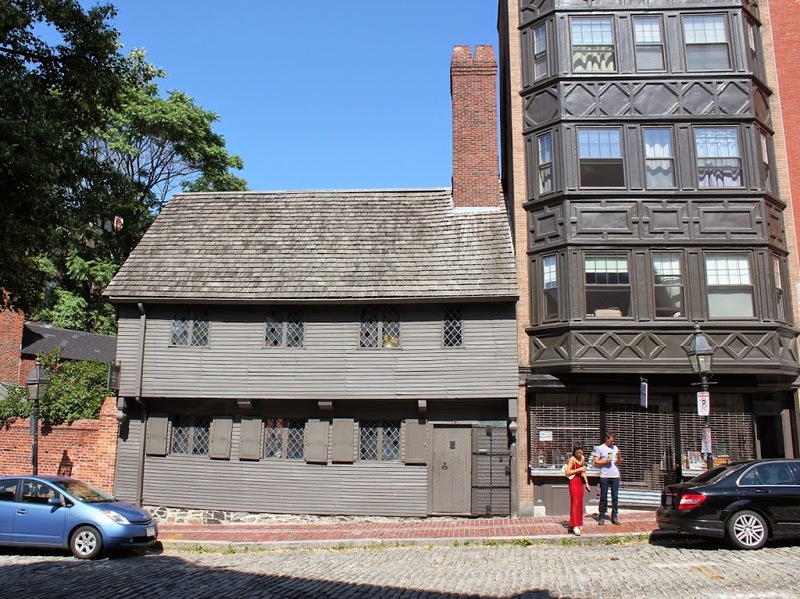 Built in 1680, Paul Revere’s house is the oldest building in downtown Boston, and was owned by Paul Revere from 1770 to 1800. 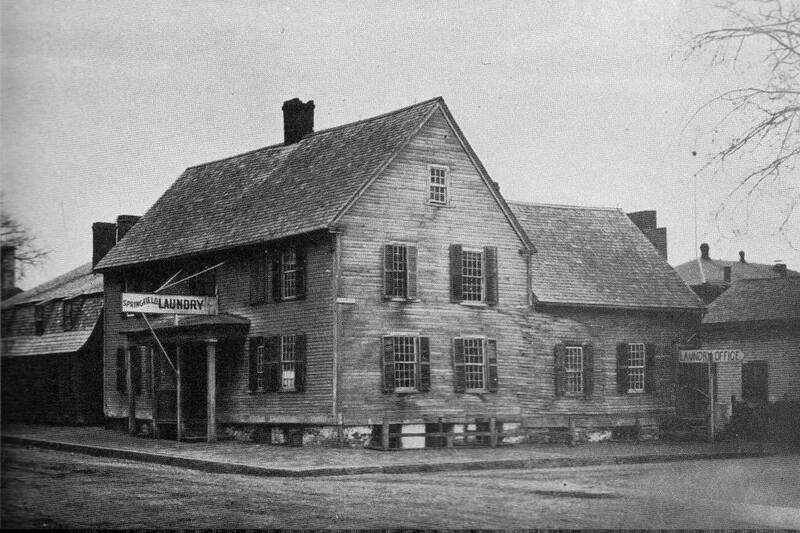 He actually added a third floor, as seen in the 1898 photo, but shortly after the photo was taken, the house was purchased by one of Revere’s descendants and restored to its 1680 appearance. Despite all of the modifications, it is estimated that about 90% of the structure is original to 1680, which is impressive, considering how different it looks in the two photos.